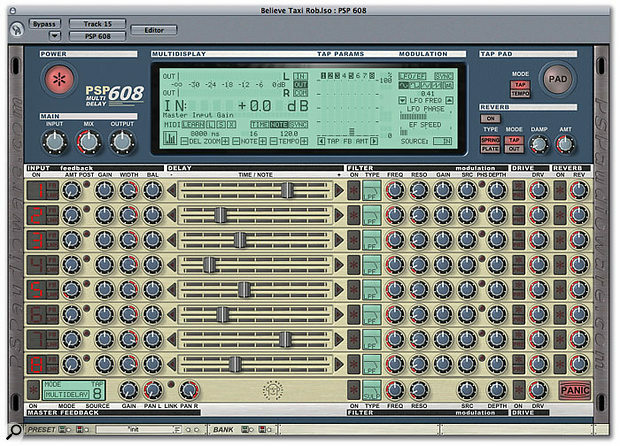 While some plug-ins are essentially processing tools with very little romantic attachment, PSP's 608 'Multidelay' might best be described as creative fun! As seems to be PSP's style, they've taken an old concept and then added so many clever ideas and refinements that it almost becomes a new concept. What they've done here is create a multitap delay that can have up to eight taps, independently adjustable via eight horizontal sliders, each offering up to eight seconds of delay time. The plug-in actually operates in two basic modes: Multidelay and Multitap. In Multidelay mode, each tap has its own feedback settings, while in Multitap mode there's a master feedback setting for the whole effect. In either mode, each tap maintains independent adjustment of gain, stereo width and balance, its own multi-mode resonant synth-style filter, filter modulation via LFO or envelope, tape-saturation emulation and a reverb send, though the filter modulation is fed from a common LFO and envelope follower. Similarly, the reverb amounts can be varied but the overall reverb settings apply to all taps. To further extend the versatility of this paradigm, PSP have made it possible to have the feedback and tape drive controls at the beginning or end of the signal chain. If this is starting to sound like fun, you'll be pleased to hear that both Mac OS and Windows platforms are supported with the following minimum conditions. Windows: Intel Celeron 1GHz or faster processor with 256MB RAM running Windows XP and a DX, RTAS or VST-compatible host audio application. Mac users need a Power PC G4 processor or better with upwards of 512MB RAM running Mac OS 10.2 or above. AU, HTDM, RTAS or VST hosts are supported and sample rates up to 192kHz can be used. Full plug-in automation is available via your host sequencer and where the host publishes tempo data, delay times and the LFO can be locked to multiples of the song tempo if required. That means that delay times can be set in milliseconds or to selected note quantise values to create solid rhythmic effects. Installation requires an authorisation number from PSP but is very painless and doesn't hinder you when you need to transfer the plug-ins to a new computer; iLok protection is also available for the RTAS and HTDM versions but not for the AU and VST versions. Though it has only simple controls, the reverb can be set to emulate springs or plates and has variable damping (decay time), so by combining all these different ingredients, PSP 608 can do a pretty good impression of a vintage tape echo, it can replicate most standard echo/delay effects and it can manage envelope-controlled resonant filtering for that wah/synth filter sweep effect on individual repeats. Intriguing delay effects can be set up very easily, and in most cases it would take a whole collection of plug-ins working together to come close to the same result. Even the filters can be switched to different types based upon low-pass, band-pass, high-pass, peak and four shelving modes. The filter frequency can be modulated over three octaves (with a control that balances the LFO and envelope modulation sources) with a user-settable start frequency and resonance. Ohm Force's Ohmboyz is similar in concept to PSP's 608, and although it has only four delay lines, its comprehensive modulation, filtering and distortion options give it similar flexibility for creating both vintage and avant garde effects. You could also investigate Native Instruments' Spektral Delay, which works in a rather different way, but offers similar dollops of weirdness. The PSP 608 plug-in window is fairly densely packed but still logically set out, with the interactive Multi-display 'LCD' showing a lot of information at one time and also acting as a parameter input area. The Multi-display shows, amongst other things, the eight Tap parameters and modulation status as well as level metering with peak hold. Metering can be switched to follow the input or output level, and there's also a comparative mode that monitors both and always shows the highest. Cleverly, the Info display section of the screen changes to relate to whatever function you have your mouse over, and the selected parameter values are represented by eight vertical bars (one per tap) that can also be moved in the manner of sliders. The contents of the virtual LCD change to reflect the position of the mouse over the plug-in's controls. A tap tempo button may be used either to set the tap times directly or to set a tempo for the whole effect to sync to. This is in addition to the facility to sync to the host sequencer's tempo. There's a MIDI learn mode, which is useful if you want to control specific parameters from a hardware MIDI control surface, as it makes assignment very straightforward. Another time-saving feature is the Link button, which enables one parameter control to alter values across multiple delay taps. A solo function allows different taps to be auditioned, and intuitive on/off buttons permit the tape saturation, filters, reverbs and so on to be configured very quickly. The PDF manual is very well written, too, so it doesn't take long to learn to drive the plug-in. Setting up a tape-delay simulation isn't too difficult, as all you need are three or four delay taps to simulate the tape heads, some high-cut filtering to emulate the restricted high end of those old machines and just a little drive to dirty up the repeats. Adding a little reverb can help cloud the sound in a musical way and you can add feedback to create more repeats in the usual overall way or on a per-tap basis. If you want to get a little more sophisticated, you can set up resonant filters on each tap to create a different tonal colour for each repeat, then you can modulate the cutoff frequency by using a combination of LFO and input envelope to create filter sweeps or LFO wobbles acting on some or all of the repeats. With just a little experimentation, you'll find that PSP 608 is capable of a wide palette of musical effects, from warm and cosy to thin and ethereal. The tempo-sync ability is, of course, very useful for getting rhythmic repeats in time with your song and being able to use reverb within the delay algorithm throws up some unusual possibilities. What I look for in a plug-in is the ability to create musical effects that go some way beyond the norm but without getting so complicated you can't be bothered to use them at all. PSP seem to have exceeded these requirements by going further beyond the norm than usual, but they've still kept the user interface simple and they've created a large library of presets that show off different aspects of the plug-in. Even if you just tweak these rather than starting from scratch, you'll still get a lot out of it, and guitarists in particular will find this a very rewarding plug-in. I had rather hoped for LFO pitch modulation on individual taps, while formant filters in addition to the usual synth-style filers could have opened up interesting possibilities, but the designers had to draw a line somewhere to stop the plug-in getting unwieldy. You can always patch a chorus or flanger in series with it if things aren't weird enough as they are! If you're into delays but find the current crop rather samey, PSP 608 comes highly recommended. Wide range of well constructed presets. As with some other PSP plug-ins, some parts of the display are quite small at certain monitor resolutions. Quirky, musical, intriguing. Buy it.